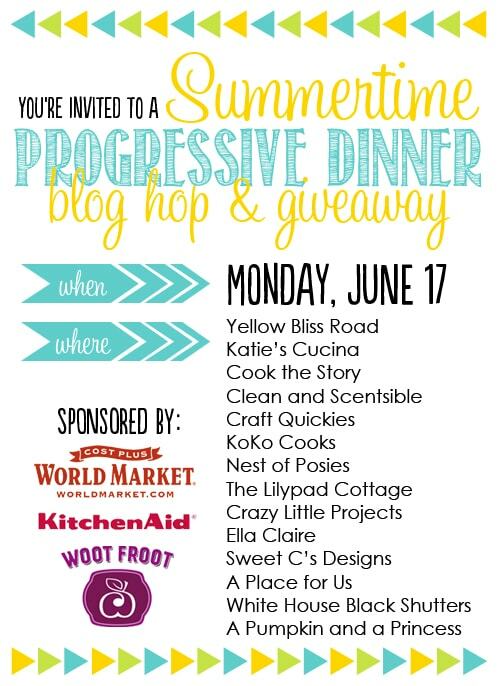 Are you all ready for another Progressive Dinner Blog Hop Giveaway extravaganza? I’m teaming up with these other fun bloggers and some great sponsors to share our favorite summertime recipes perfect for your next BBQ. 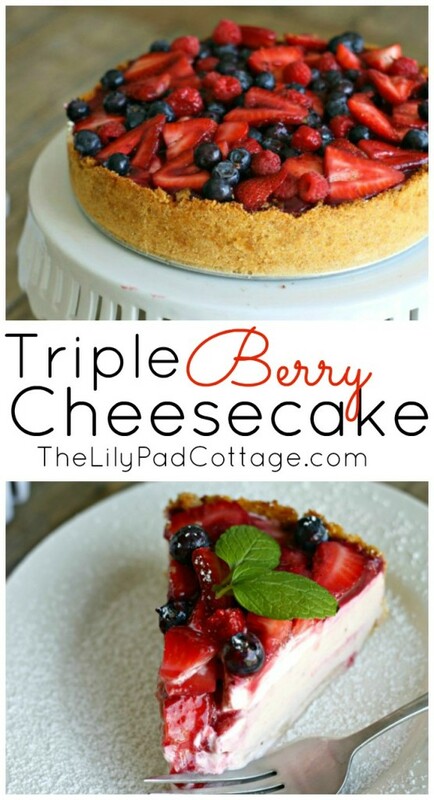 This time around I’ve got dessert duty and I’m sharing my Triple Berry Cheesecake Recipe. This is my little twist on my mother’s famous cheesecake recipe. She always made this whenever we went to dinner at someone’s house when I was young. I didn’t appreciate the deliciousness of it at that point of my life – I thought dessert should have chocolate and not cheese in it, but now I have seen the error of my ways. 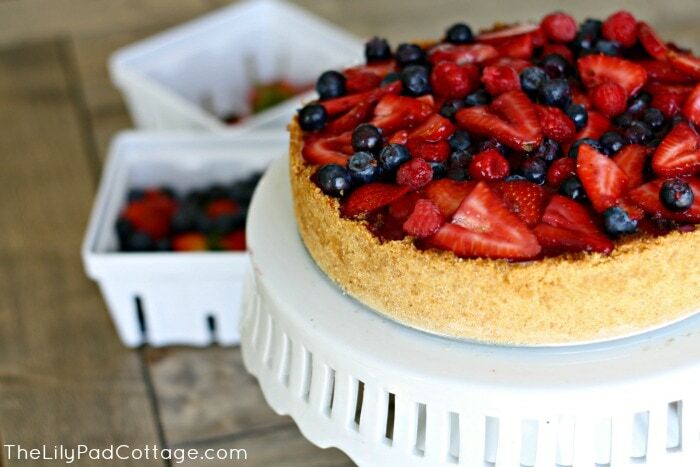 My mom is a purist and prefers her cheesecake plain, but I love to add the brightness of fresh berries in the summer. This is the perfect dessert to take for a backyard BBQ or to an elegant dinner party. It looks pretty and is a crowd pleaser. I love that this recipe is light and airy not dense like a New York style cheesecake. I will warn you that it seems like there are a lot of steps, but I promise this isn’t complicated. The best part is it needs to refrigerate overnight so you can make it the day ahead. So excited to see what my fellow bloggers are cooking up. Just looking at these photos has my stomach growling! Don’t forget to enter our amazing giveaway! We are so excited to be working with such great sponsors! A big thanks to KitchenAid – they are giving away a 5 speed hand blender perfect for making soups and sauces (I so want to add one of these to my kitchen gadget collection!). 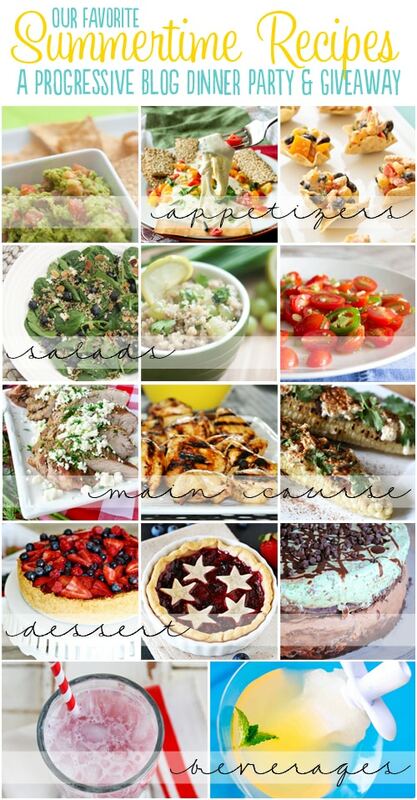 Make sure you visit KitchenAid’s blog The Kitchenthusiest for all sorts of great recipes and ideas too! One of my favorite stores to shop at is Cost Plus World Market – I love to browse all the unique food items, fabulous furniture and cool accessories they offer. They have added a $200 gift card to the giveaway, imagine all the great decor items you could buy! Oh and check this out – Woot Froot is excited to bring you the ease and convenience of fresh cut peaches and nectarines just in time for summer. Perfect for summer snacking, dishes and drinks – like peach margaritas. Be sure to fill out the Rafflecopter below for your chance to win this Margaritaville Margarita Maker and get the party started. A $200 value. To enter the giveaway, use the Rafflecopter below. You can also earn a bonus entry by following myself or any of the other participating bloggers. The giveaway will be open until 6/24 – good luck! Official stuff – I did not receive any compensation or product for participating in the Summer Progressive Dinner Party. I love these brands and wanted to share the love with you all with an amazing giveaway! 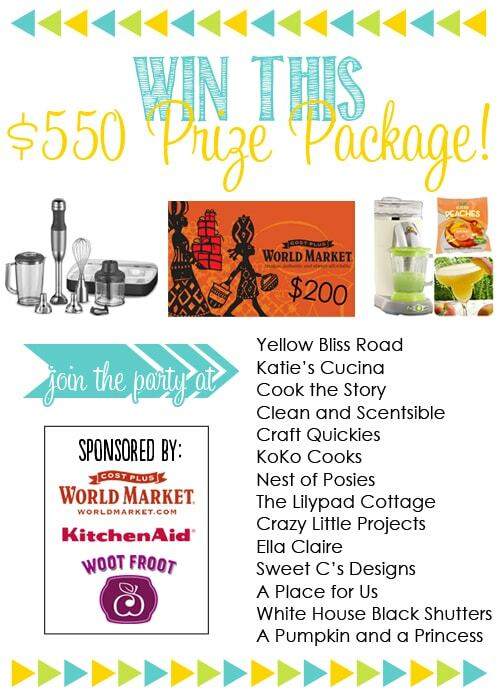 KitchenAid, Cost Plus World Market, and Woot Froot all provided the prizes for the giveaway. The opinions, recipe and good time are all my own. Additional strawberries, blueberries and raspberries to top the cake with. Berry sauce: combine berries, sugar and orange juice in small saucepan cook over med/high heat until the berries break down and thicken. Puree in a blender and strain. Refrigerate until ready to use. Crust: Mix graham cracker crumbs, sugar and melted butter in the bottom of a 9 in spring form pan. Gently press the crumb mixture up the sides of the pan and over the bottom of the pan to form a crust. Refrigerate until ready to use. Filling: Pre-heat oven to 375. Mix softened cream cheese, eggs, sugar, and vanilla with a mixer until smooth. Gently pour filling into the graham cracker crust. Drizzle half of the berry sauce over top and gently swirl in with a knife being careful not to ruin the crust. Bake for 20 minutes. Remove from oven. Let sit for 15 minutes. Increase oven temperature to 475. Sour Cream Topping: Mix sour cream, sugar and vanilla. After the baked cheesecake has sat out of the oven for 15 minutes gently top with the sour cream topping and bake additional 10 minutes at 475. Let cool, refrigerate overnight. Just before you are ready to serve, toss the additional fresh berries in the remaining berry sauce. Gently top the cheesecake with the berry mixture. Enjoy! It's very important to let the cheesecake sit for 15 minutes before putting the sour cream topping on - if you don't the topping will sink right to the bottom. Oh Kelly this looks so good. I’m right there with your mom–I’m a lover of cheesecake although I definitely prefer berries on top! You can never go wrong with a cheesecake in my book! I like the idea of a berry sauce swirled into the cheesecake, along with all those beautiful berries on top. Looks yummy! This cheesecake looks and sounds so good. The colors would be perfect for 4th of July! Looks delicious! I would bring the Mini Berry Pies. Love it, I have done strawberry cheesecake and it is always a hit but this looks so much better, I will have to try this soon. Made this cheesecake last night and it turned out looking and tasting amazing! Received lots of compliments! Thanks a alot for sharing the recipe! :) Will be making it again soon. lol! How much would you charge for each? Hi I am going to make this and I was wondering if I have to put the sour cream topping on top? Or can I make it without the sour cream topping?